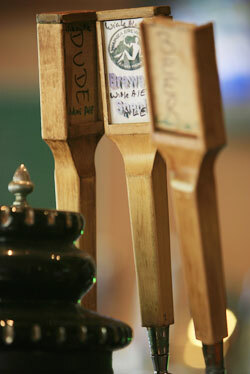 Waimea Brewing Company's pub and restaurant brews all its beers on site. 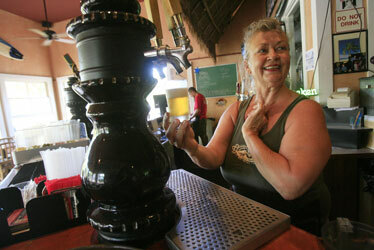 WAIMEA » Mary Cusimano has been serving up the "last beer before tomorrow" for 10 years. She sees about 500 people on a busy day, some celebrities, mostly visitors. » Open: Sunday through Thursday, 11 a.m. to 9 p.m.; and Friday and Saturday, 11 a.m. to 11 p.m.
"I've waited on people from all over the world," she said. "They want to come to us because we're the westernmost brewpub on the earth." Waimea Brewing Co. is situated in a plantation-style cottage on ResortQuest Hawaii's 27-acre coconut grove resort on Kauai's west coast. Brewer Dave Curry, known for his Lilikoi Ale and Captain Cook's Original IPA, has a tough time keeping a handful of his beers on tap. He brews in two small rooms sandwiched between the bar and the kitchen and only has storage capacity for 155 gallons of beer, or 10 kegs. "Half of what I brew, I brew for the light-beer drinkers; the other half is for darker-beer tastes," said Curry, who came to Waimea in 2002 after several brewing posts on the West Coast. "Budweiser is still very popular among the local crowd, but it's not unusual to see them trying something they wouldn't have been trying in the past." The brewery nearly shut down in August when its Seattle-based owners stopped ordering ingredients in a failed attempt to sell, and taps ran dry for several weeks. It also dabbled in contract bottling in California several years ago, an endeavor that owner Bret Larson said he might start up again soon after working through recipe and cost glitches. Larson, a Boeing engineer who lives in Issaquah, Wash., said he and several other investors planned to build a German-style brewery in an old Waimea Sugar Mill Co. building in 1995 but did not have the $2.5 million they needed. "Being engineers, we struggled for a couple years, and none of us really wanted to sell our houses," he said. "So we ended up going down the street." Mary Cusimano, one of four managers, pours a sample of their brew. » Wie's LPGA future not so promising?